A TRADITIONAL butcher’s shop which has been trading for almost 180 years is closing down after its owner decided to give up his uphill battle against supermarket competition. 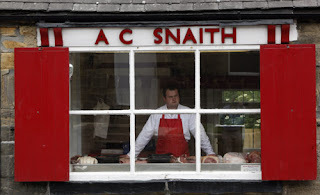 The shop in West Road, Ponteland, Northumberland, has been serving customers their meat since being established in 1831, and has traded for the last 89 years as AC Snaith. Apart from a couple of historic pubs, it is the oldest surviving business in the village. Now owner Rob Grant, 26, has reluctantly sold up and will close his doors for the last time this weekend, after concluding that there is no viable future for the business. Fierce competition from supermarket rivals, changes in the way people buy and cook meat and a growing reluctance to support the smaller retailer have all been blamed for the demise of the 179-year-old tradition. Mr Grant, a former speedway rider with the Newcastle Diamonds, got involved with the shop six years ago and has owned and run it for the last three. Yesterday he said the opening of a nearby Waitrose supermarket last year had resulted in a slump in trade, and led him to the decision to sell up and try to return to his former profession. “People’s way of living has changed and they don’t tend to use traditional small shops like they used to now. Things have deteriorated over the last two years and the Waitrose supermarket, 200 yards down the road, has caused horrific problems. People just park there and do all their shopping in one go. “It is just impossible for us to compete with them, especially on a Saturday when they reduce their stuff to clear it. Also, if I’m being truthful, I don’t think people know how to cook, or want to, these days.It is more convenient to just microwave things. “It is a sad state of affairs that such a well established business as this is closing, when people used to travel here from miles around and our sausages used to go all over the world at one time. Mr Grant, who joined the Newcastle Diamonds when he was 16, says he will now try to re-establish his speedway career and hopes to ride again.